In talking about jobs-to-be-done here, I sometimes think that all I’m doing is stating the obvious. I mean, isn’t it obvious that you’d create something that helped fulfill a need or desire? What else would you do? Exercising creative chops was the focus, with a thought that customers would have to take up this amazing thing invented. But unfortunately, that’s not generally the case. The invention is not adopted, and thus nothing changes for the target market. Innovation does not occur. The invention either does not address a job-to-be-done or the proposed solution was nowhere near satisfying the specific outcomes of an applicable job-to-be-done. To illuminate how this “product-first” dynamic is a pervasive dynamic, I’ve collected ten examples of it. While the plural of anecdote is not data, see if you recognize similar examples in your own experience. 1. Because Apple, Microsoft, Google did it! Kareem Mayan wrote a great post Why only fools write code first. In it, he stated, “I have a confession to make: I’m 35, and until last year, I started building companies by creating a product.” The post describes on his evolution in thinking, focusing first on customer needs before building anything. This argument expressed skepticism about Kareem’s point. A good example of the ongoing pervasiveness of product-first thinking. It really is everywhere. Here, the commenter displays a classic example of the survivor bias. A focus on only those companies that made it, and what they do. Ignoring that perhaps dozens of competitors also charged ahead with their own product-first approaches. And were nowhere near as successful. It’s like looking at the ways lottery winners live, and saying that’s the way you should live too. They’re not connected. Way before Marissa Mayer joined Yahoo, the company was a case study in mediocrity. From its glory days in the 90s, it had managed to become a bloated collection of media properties, without a coherent strategy due to a succession of changing executives and business models. As reported by Kara Swisher on All Things D, Yahoo’s home page became increasingly overrun with links. To cram more stuff above-the-fold, font sizes shrunk. It became a nasty hodge podge of links that no longer related to what users wanted. What Yahoo wanted the user to. What a wonderful expression of the approach. It’s such a pernicious mode, where the needs of the company eclipse those of the customers. Call it inside-out thinking. When the company’s, not the customers’, needs drive product and service decisions, it’s a good bet customers will turn elsewhere. It’s a great opportunity for competitors. Anyone remember the hype over Dean Kamen’s project code named Ginger back in 2001? Turned out to be the Segway, that amazing triumph of technology that allowed people to travel on a motorized two-wheel scooter. It really is amazing, with its self-balancing mechanism, easy navigation and smooth ride. Wow! So what happened? 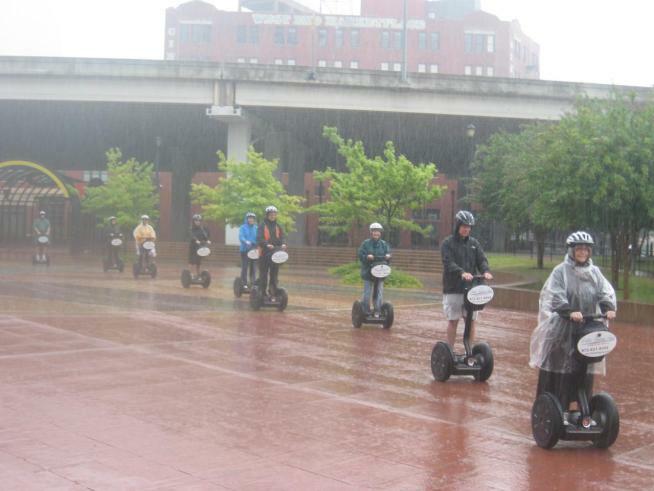 Well, have you taken your Segway out for a spin today? It missed the mark in terms of how frequent the job-to-be-done was. For me, Segways are what tourists rent to travel around Golden Gate Park in San Francisco. My own perspective is that Segway is an optimum mode of transport for journeys where walking would take more than 10 minutes and less than 30. And where you don’t need to carry anything heavy or bulky. And where weather would be OK for the journey. Steve Jobs, who did heap praise on it, was prescient about what needs it didn’t fill. So Jobs and Bezos were full of praise, but in a hard analysis couldn’t quite say what mass job-to-be-done the Segway fulfilled. And it turns out most of the market couldn’t either. Sometimes the invention is so dazzling, we’re blinded to understanding what need it actually fulfills. Invention first thinking. Ron Johnson did a fantastic job of creating the Apple stores. They’re enjoyable to visit, full of all the latest in cool technology Apple has to offer. The clean vibe, the on-the-spot purchasing, the Genius Bar. Clearly he brought some of the experience from his Target (aka “Tar-jay“) days to the job. Based on this, the Board of JC Penney installed him as CEO to restore a retailer that had lost its luster. Johnson put in place a number of changes to reinvigorate the retailer. He stopped the discounting, going for a low price everyday approach (like Target). He developed brands that would be exclusive to JC Penney (like Target). Trained employees to help people shopping (like Apple). There it is, product-first — or maybe vision-first — thinking. It’s tempting to look at this as the hubris of being smarter than customers. But I don’t think that’s the lesson to draw. Rather, this is a case of previous success with a format in other markets (Target, Apple), and applying it to a new market. Without understanding the customers in the new market. The fact that Johnson didn’t feel the need to run the new strategies by JC Penney’s customer base was due to his success with the template previously. Why test? You know what customers want. But in this case, it led to overlooking existing customers and what they outcomes were being fulfilled by JC Penney. This alienates the core customer base, while potential new customers ponder why they’d switch from Target to JC Penney. Unsurprisingly, the stock dropped 55% during his tenure, with a horrendous 32% drop in same-store sales in the critical holiday 4th quarter of 2012. Tired of people saying you should listen to the marketplace, Dan Waldschmidt advocates something different. He argues that most of the time, people don’t know what they want. In making his argument, he references both American slavery and Martin Luther’s religious reformation. One of the things business experts tell you when you are considering changes to your sales strategy is the idea that you need to “listen to your marketplace”. That you need to take your idea and run it by the people around you to get some feedback. Instead, blaze a new trail. Think about where you want to lead your market. Perhaps the key phrase is lead your market. That, in and of itself, is fine. Lead your market in sales. In profits. In innovations that resonate. But in the context of (i) ignoring the marketplace; and (ii) blazing a new trail, it comes across as advice to tell the market where it needs to go. Which actually is nice if you can accomplish it. Alas, the business landscape is littered with folks who tried to tell the market where to go. The market can be fickle that way. To be fair, it is important to separate the jobs-to-be-done from the potential solutions. That’s a better way to think about Dan’s advice. Run a search on that exact phrase, and 687,000 results are returned. It’s a sentiment from one of the all-time greats that clearly has caught on. And he was quite good. Sound like he’s advocating to ignore your customers? Designed to be a drop-in replacement for the existing home screen (“launcher”) on an Android device, the software provides a replacement home screen that allows users to easily view and post content on Facebook along with launching apps, a replacement lock screen that displays notifications from Facebook and other apps, and an overlay which allows users to chat via Facebook messages or SMS from any app. Note that the existing Facebook app was still available, allowing you to get your Facebook updates via the phone. What Facebook Home does is elevate Facebook above all others on the phone. It was a play to get Facebook front and center in your daily experience. There would be access to all your other apps, but the path to them would go through Facebook each and every time. Ultimately, Facebook Home withered in the market. I can understand why. In 2012, mobile time spent on Facebook surpassed time on the Facebook website. From a user experience perspective, Facebook wanted to make mobile even easier. From an advertising perspective, Facebook needed to establish a way to present more mobile ads. Imagine serving up an ad every time someone turned on their Android phone. In a post, entrepreneur Ramli John talked about lessons he’s learned from failed startup efforts. Specifically, the experience gained with Lesson Sensei. Lesson Sensei didn’t make it. This is a classic issue. There’s a hazy sense of what an idea could address. It’s not nailed down yet, but there’s the rush of starting on the solution anyway. To be fair, there is some merit in this. You could be 50% there in terms of product-market fit, and the initial product can help elicit the right iterations. But as Ramli notes, that can be an expensive approach. It burns time, energy and money. And depending on how hazy that view is of the actual job-to-be-done and its attendant outcomes, you may be entirely off track. Robin Chase is the founder and former CEO of Zipcar (acquired by Avis in 2013). After Zipcar, she founded GoLoco, a carpooling app. Unlike Zipcar, GoLoco didn’t make it. She is now leading Buzzcar, a peer-to-peer car sharing service. In some ways, this is a similar situation to Ron Johnson at JC Penney. Having been successful in getting Zipcar going, Robin had a confident attitude about her new endeavor. That confidence led her to develop first, worry about customers later. As she notes, this was backwards. The spade work of understanding customers’ needs is a critical first step. Remember Color? This app would let you take pictures. These pictures were then visible to anyone with the Color app within 100 feet of you. It was a way for friends or strangers to participate together in some close proximity. Color is no more. It didn’t fare well. It was a can’t-miss app. It was started by an energetic, persuasive entrepreneur whose previous company was bought by Apple. It was SOcial. It was LOcation-based. It was MObile. It was SoLoMo! With that combination, Sequoia Capital and Bain Capital felt confident investing $41 million. Product-first thinking. Presumably, the entrepreneur’s previous success was a good-enough proxy for understanding the target market’s jobs-to-be-done and attendant outcomes. However, as seen with GoLoco above, previous success doesn’t automatically grant the ability to divine customer needs. There’s still the work of understanding the market you intend to tackle. Remember this next time you see another startup in an overhyped space, say Big Data. What job-to-be-done does it fulfill? Perhaps not surprisingly given my work experience and interests, these examples have a heavy technology orientation. One can imagine similar cases in financial services, apparel, consumer product goods, etc. Hopefully the examples here will be useful as you look at your own world. And in your own work. I’ll admit to being guilty of product-first thinking. The creative muse is a strong human characteristic. But recognize when that muse is taking you down a path you shouldn’t go. "There's a plane in the Hudson. I'm on the ferry going to pick up the people. Crazy." With these rubbish phone cameras we take terrible photos of some of our most important moments and cherished memories. I am not complaining about composition and lighting here; I’m not a photographer. I am talking about the quantity of meaningful visual data contained in these files. Future historians will decry forever the appalling lack of visual fidelity in the historical record of the last decade. I read that, and at first though, “Yeah, that could be an issue.” But then I realized that, well no, it’s actually the opposite. The rise of cheap phone cameras is actually increasing the historical record. This even has disruptive innovation undertones to it. "The line at 9 am at the Pleasanton @sfbart stretches for blocks. Huge crowd downtown today for #sfgiants parade." Now moments are always going to arise. They may be significant moments, such as Janis Krums’ iconic picture above after a US Airways plan crash landed on the Hudson. Recently, the San Francisco Giants were celebrated for their 2010 World Series title with a ticker tape parade in downtown San Francisco. When I arrived at the Dublin/Pleasanton BART the morning of the victory parade, I was shocked by the number of people waiting in line for get to SF. Before I got a phone with a camera on it, I had no way of photographing any moments. I could tweet about them, email a description of them and tell people about them. But there was no visual record at all. I wasn’t carrying a camera around with me. Just not something I wanted to deal with as I also carried my ‘dumb’ phone. And wallet. And keys. Just too much to deal with. But a camera included with my mobile phone? Oh yeah, that works. I’ll have that with me at all times. Which is a much better fit with the notion of capturing moments. They are unpredictable, and do not schedule themselves to when you’re carrying a separate camera. The X/Y variable represents the decrease in data per picture. If Y is the “full” data from a high resolution photo, then X is the reduced data set. The loss of scene details, the inability to discern people’s expressions, etc. Yeah, that is a loss due to low quality cameras. The B/A variable represents the increased number of pictures enabled by the proliferation of convenient low quality cameras. If A is the quantity of photos with high resolution cameras, B is the overall number of photos inclusive of the low quality cameras. Multiply the ratios, and I believe the overall historical record has been improved by the advent of phone cameras. In other words, “> 1”. Something the higher quality, standalone cameras have lacked is connectivity. They miss that aspect we have to share something in the moment. The fact that I can share a picture just as soon as a I take it is extra incentive to take the picture in the first place. I share my kids’ pics with family via email, and other pics end up in my Twitter and Facebook streams. You know how painful it is to upload photos from the camera and share them? Very. Standalone cameras are like computer hard drives, locking data off in some siloed storage device somewhere. Good luck to historians in extracting that photographic data. This is the disruptive innovation of convenience. People are swapping the separate cameras for the all-in-one mobile devices. And like any good low-end innovation, the quality will increase. Meaning more pictures with better detail and fidelity. I mean, imagine if there were a bunch of phone cameras at Gettysburg? We’d have thousands of pics, and it’d be a Twitter Trending Topic. As for the lower data per picture, damn the torpedoes, full steam ahead. Phone cameras will enrich the historical record for future generations. It tells me that Twitter isn’t lame anymore. Remember those days when Twitter was for telling all your friends you were having a tuna sandwich at Subway in Half Moon Bay? Yes, Twitter has grown up and become much more than the report of what you’re eating for lunch. Which brings us to Foursquare and Gowalla. These services are in their early stages, with Foursquare outnumbering Gowalla four-to-one in members. Some of us are experimenting with these location-based services. For me personally, it feels like those early days of Twitter (“What should I tweet?”). The biggest difference since my early Twitter days is that I’ve got more experience with this sharing behavior, and I’m comfortable trying different approaches. With that in mind, I wanted to describe some early thoughts on Foursquare and Gowalla etiquette. Louis Gray wrote a post recently asking whether people are censoring their check-ins to maintain hipster cred. It’s a good, if somewhat painful, examination of the fact that we do have some serious hum-drum in our lives. People’s comments on the post are illuminating, as some admit this behavior, but also note that they don’t want to bore everyone. The three levels each have their own unique use cases, and their own check-in etiquette. Now it may be boring, but I’ll bet there’s a badge out there for multiple gas station check-ins. Maybe someone will earn a Gas Guzzler badge (as opposed to the Douchebag badge). It’s all part of the fun. A festooned Foursquare profile. But there is a role for curating your check-ins. I really don’t need to know about your gas station check-ins. That applies to my interests, and it applies to what I assume to be the interests of my connections on the location-based services. Sure, share your whereabouts, but please have some mercy on those who follow you. We successfully graduated past the “What are you eating for lunch?” stage of Twitter. And good luck with that Gas Guzzler badge. People that follow you on Foursquare and Gowalla are participating in another aspect of location-based social networks. The “keeping tabs” aspect. You see what others are doing in the course of their day. For instance, I was able to see that Techcrunch’s MG Siegler was in Japan a few weeks back, via his various Gowalla updates. I’ve also found a use case in ethically “stalking” various tech pundits (I hate that word) and found a couple of high value events I would otherwise have missed. 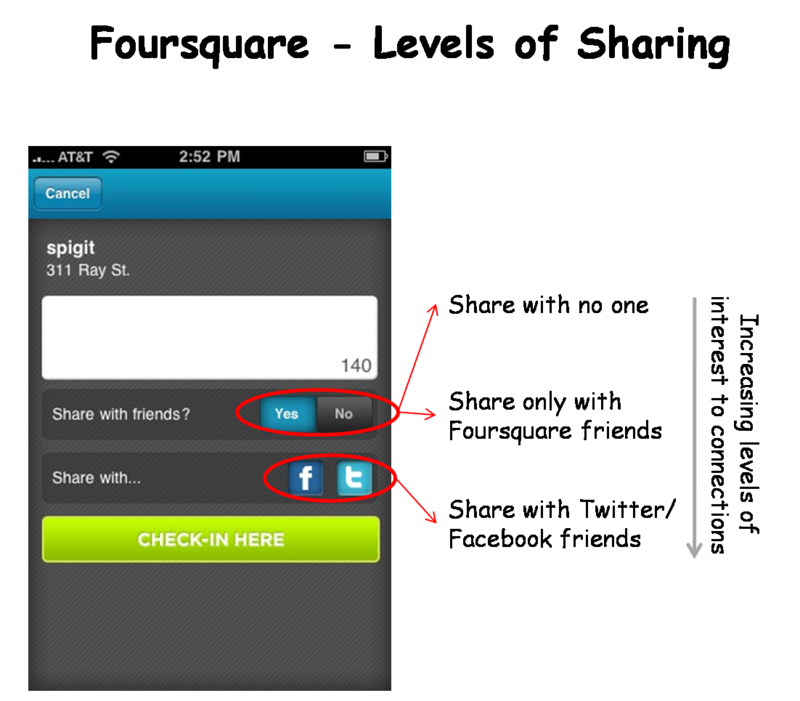 Personally, I look at things like work check-ins as de rigeur for this level of sharing. Whereas gas station check-ins may bore your connections, the work stuff is of greater interest. I’ll often see CEO Eugene Lee’s check-ins at Socialtext headquarters. As head of a major software company, I’m sure he has to travel a fair amount. So the check-ins to HQ tell me he’s working away in the office. I check in to Spigit every day. Proud to say I’m the Foursquare “mayor” of Spigit, oh yes. But I’m competing with several colleagues for that title. I share these check-ins with my Foursquare and Gowalla connections. But not with my Twitter/Facebook connections. Those folks didn’t decide to follow me based on my daily work check-ins. However, I do share check-ins, even mundane ones, on Twitter at times. I’ll explain in a second. First, interesting ones are a no-brainer. Should you find yourself with Anne Hathaway at a post-Oscars party, by all means, share that check-in! Or maybe you’re in a working session at the White House. Definitely passes the interestingness test. There’s also a good use case for alerting your wider social networks as to your location for meet-ups. 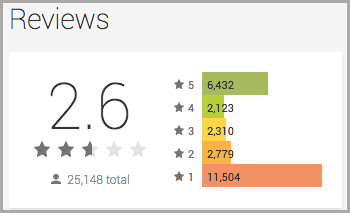 It’s a commonly cited use case for Foursquare/Gowalla. However, I’ll admit as a father with a full-time job and a mortgage, my “interesting” check-ins are few and far between, and I rarely am trying to connect with others at Trader Joe’s. And I’m not alone. The majority of people will have mundane check-ins as they go about daily life. It’s making the mundane interesting where the Foursquare/Gowalla art is. Create “tweetable” check-ins. What’s going on around you that would be worth sharing? What will some people on Twitter and Facebook find interesting? It’s something I do, and I admit it’s a bit of a game for me. “What can I tweet with this check-in?” I find it forces me to observe what’s around me, or step back from where I am consider the larger moment. I’ll never do a straight tweet of my check-in at a BART station. At least, I won’t unless I fat finger my iPhone, that is. But if I can report out the unusually cold weather we’re experiencing, yeah, tweet that! As I said above, we’re early in this location-based check-in thing. Consider the observations above a start. #8: Discussions about Facebook’s privacy settings have the feel of arguing over religion. #10: Learned something tonight. If you karaoke Journey’s “Don’t Stop Believin'”, the entire bar will be there with you. #2: RT @defrag wow. 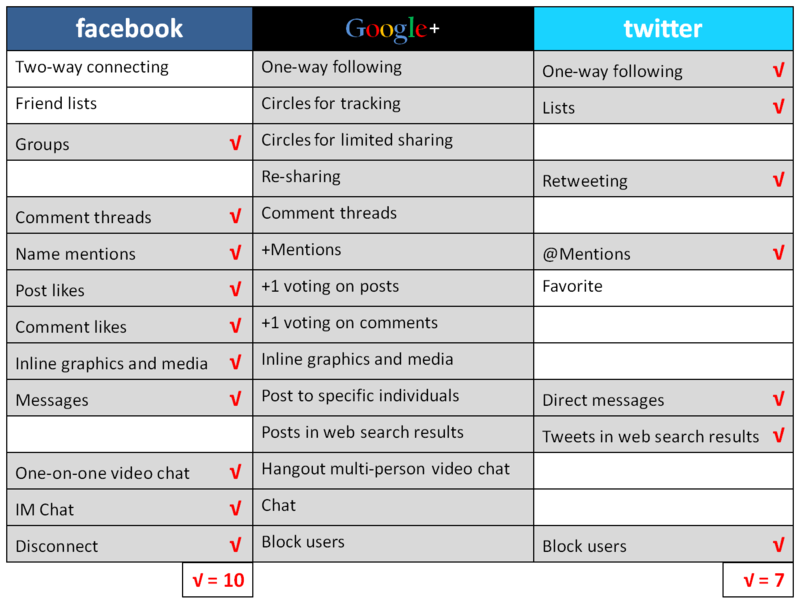 twitter moving to Cassandra (#NoSQL) – http://bit.ly/9z8nvp – so, FB, Digg, Twitter all on NoSQL. oracle, are you listening? #3: Interesting: Why the iPad can’t use flash http://bit.ly/bG6X9K > How do you “mouseover” with your finger?